First of all, Ash and I would like to wish you all the best for 2014. As some of you will know, Ash first developed the Daily Dose website for me back in 2001. We worked together for a number of years and then lost touch for awhile. However, we got in touch with each other again about a year ago and Ash developed the Recovery Stories website for me. 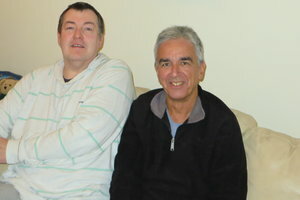 Yesterday, we met for the first time in years when I visited him in Cilfrew (near Neath), South Wales. It was good to see him and his family after such a long time. My two youngest children – Sam and Natasha – and I have been staying with Wynford Ellis Owen and his wife Meira just north of Cardiff. Wynford developed and runs The Living Room Recovery Centre in Cardiff. We attended their New Year Eve Party last night and had a great time. Thank you to all for helping us have such a great time. The Recovery Stories website has been running from late June 2013 and received its one millionth page view on the 30th of this month (there have been over six million bits). We’re pleased with these numbers, particularly as I haven’t been promoting the website much. That will change in 2014. We’ll also be introducing new facets of the website over the coming months. ‘As more and more people realise they have a problem with alcohol, other drugs (including prescribed medicines) and harmful behaviours at the beginning of 2014 and start looking for help, it’s important to understand the process of recovery which requires our being open to the possibility of transformation, to the possibility of rebirth. Thus we acknowledge the need to learn from battles against rationalisation and self-deception, the need to recognise the shadow and the darker side of human psyche, in order to understand and transcend it. I call this process ‘loving the cancer within’ whereby we embrace all that we have historically pushed away or to one side, or not liked about ourselves. When we learn to embrace that vulnerability and fully accept our humanness, it eventually becomes redemptive. And we do all this in concert with others, for we cannot embark and progress on this inevitable journey of recovery without the ongoing support and unconditional love of other like-minded people.